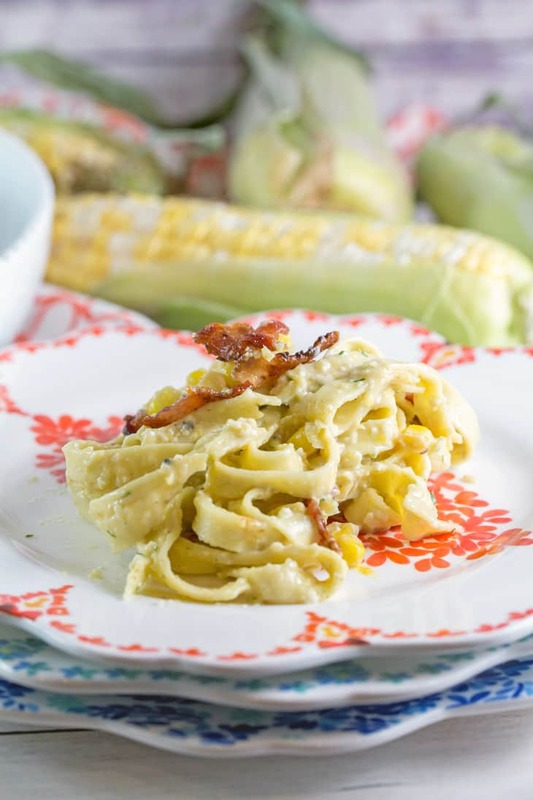 Fresh fettuccine paired with sweet summer corn pesto for a delicious, unexpected twist. Move over, basil – there’s a new pesto in town. Is there anything better than sweet summer CSA corn? Okay, fine, there are lots of things that are better than corn in the grand scheme of things, but CSA corn? Really, really good. Grocery store corn is usually mediocre at best. Farmer’s market corn is pretty good. But CSA corn is somehow perfectly sweet an crunchy and delicious every time. But (there’s always a but, right). There’s usually so much. So much corn. Like, way more corn that we could eat as corn on the cob. I like variety for dinner – grilled corn is the epitome of summer, but I don’t want grilled corn every night. 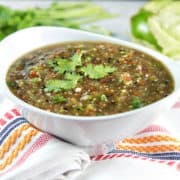 That’s where this corn pesto comes in. 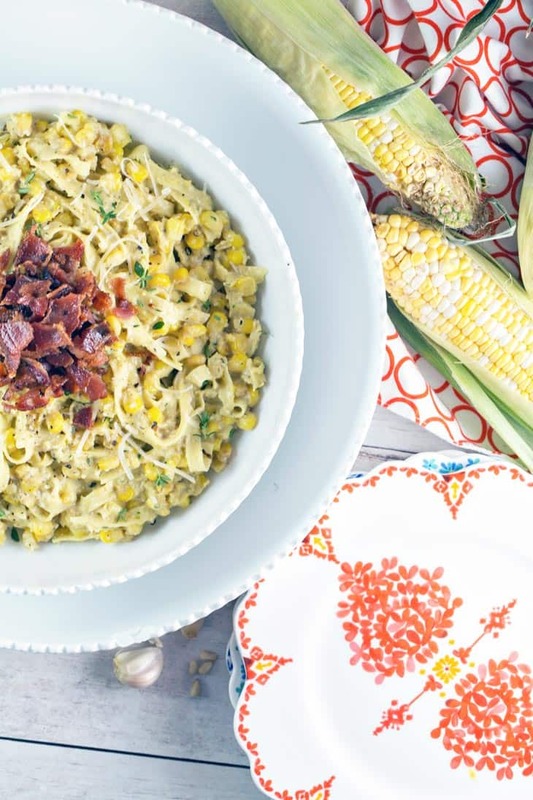 It’s delicious farmer’s market corn, but it’s a fun new way to serve it. 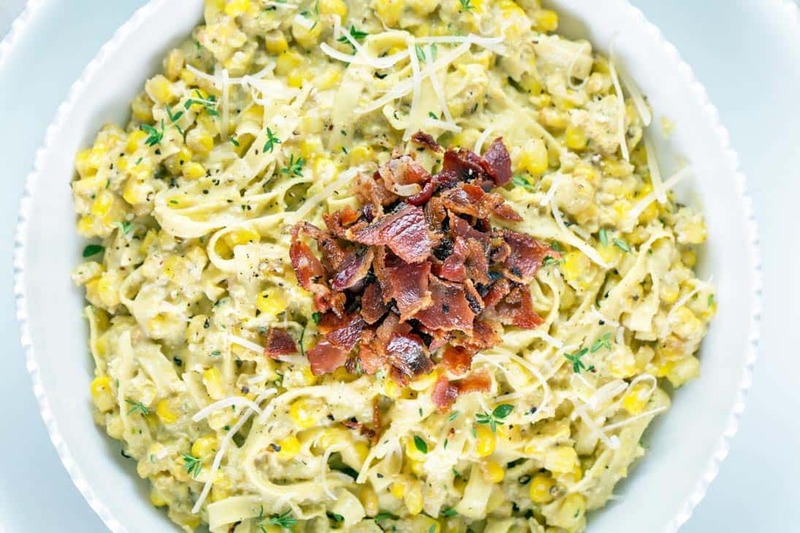 So can we talk about this corn pesto for a minute? Sweet corn and garlic, sautéed in bacon fat. Combine it with pine nuts, olive oil, and a variety of fresh herbs straight from your garden. 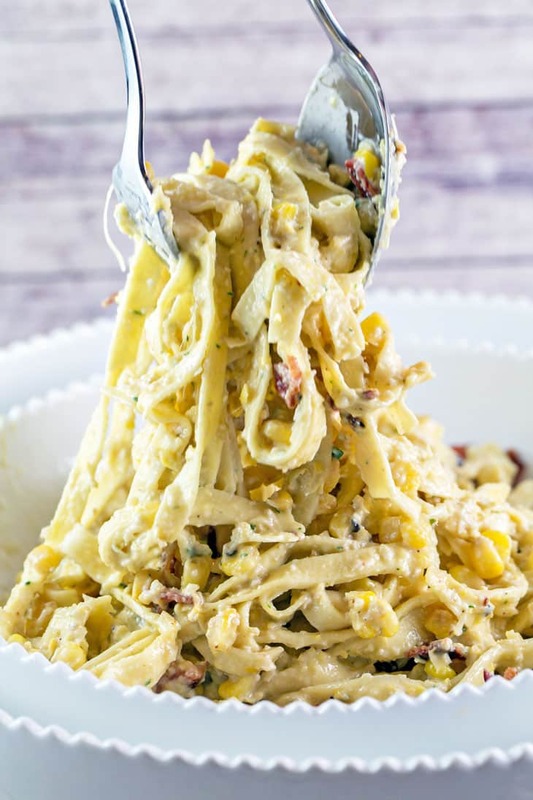 Give it a whirl in the food process or blender and toss with some fresh fettuccine. 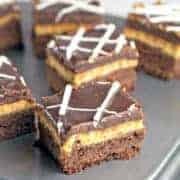 It’s so easy, super quick, and totally worthy of company. Or a Tuesday night in with your family. Did I mention how quick this is? You can make the pesto while the water boils for the fettuccine. Serve with a big green salad and some fresh green beans or broccoli from the farmer’s market or CSA, and dinner is served. I don’t usually share a lot of personal things, but boy oh boy am I d-o-n-e for the week and it’s only Thursday! We’ve hit a fairly major childcare snafu, so the little guy has been coming to work with me everyday. I love spending extra time with him, but in case you were wondering how on earth you actually get work done when you bring your toddler to work: you don’t. Well, you do, but not nearly as much work as you need to do. Ryan is such an amazingly good sport and my coworkers all seem legitimately happy when the “lab baby” comes to visit, but it’s still frustrating for both of us. He wants to run and play; I want to actually focus on my experiments. Somehow, we’ll get through this, but this week is a doozy and I know the next few will be as well. 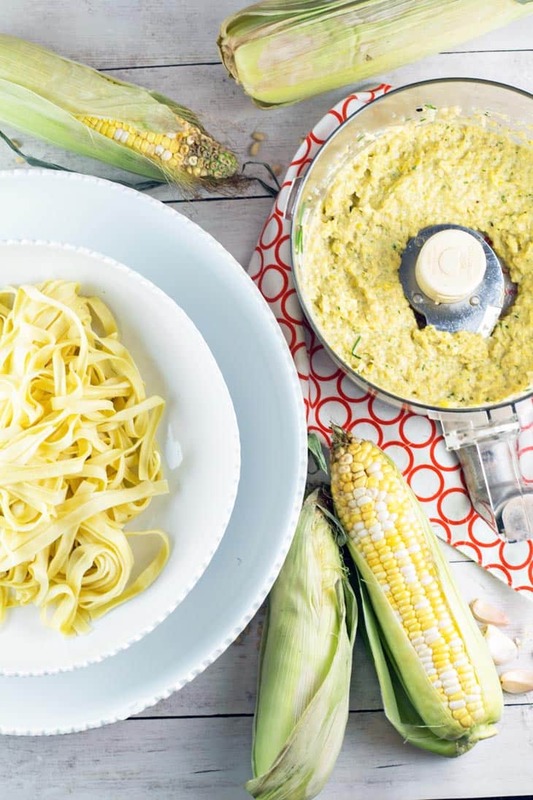 Fortunately, we have easy, sunshiny-yellow sweet corn pesto for dinner. Talk about comfort food – I can definitely wallow away my sorrows in a big bowl of this. And watching a 15 month old instinctively slurp fettuccine noodles with a big smile on his face is the perfect cure for a bad day. 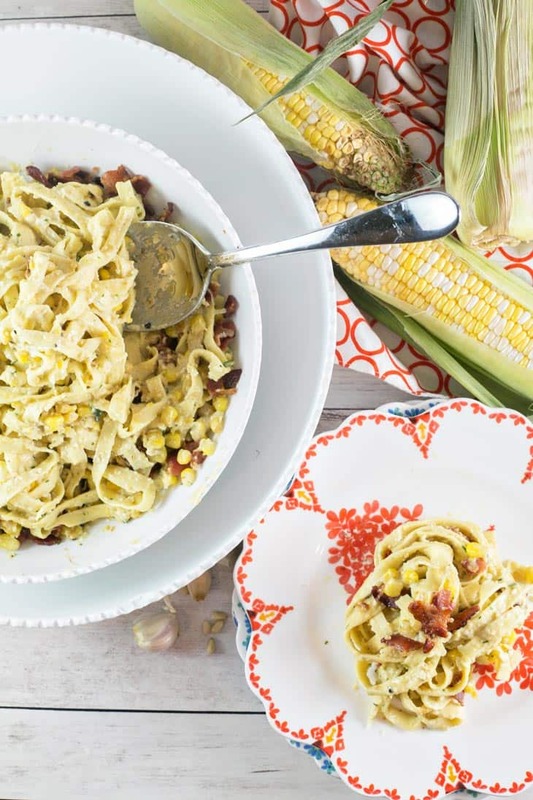 Fresh fettuccine paired with sweet summer corn pesto for a delicious, unexpected twist. Begin by boiling a large pot of salted water to cook the pasta. Once boiling, cook fresh fettuccine according to package directions until just tender, stirring occasionally. Drain pasta, saving 1 1/2 cups cooking water. Return pasta to the pot. While pasta is boiling, cook bacon in a large, nonstick skillet over medium heat until brown and crispy. 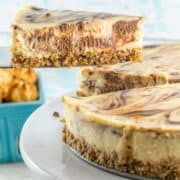 Drain on paper towels, crumble, and set aside. Add corn, garlic, salt, and pepper to the remaining bacon drippings in the skillet. Saute over medium-high heat until corn is tender, about 5 minutes. Set aside 1 1/2 cups of the corn mixture in a small bowl. Transfer the remaining corn mixture into a food processor or blender. Add 1/2 cup of the Parmesan, pine nuts, and olive oil. Process the mixture until the pesto is mostly smooth. 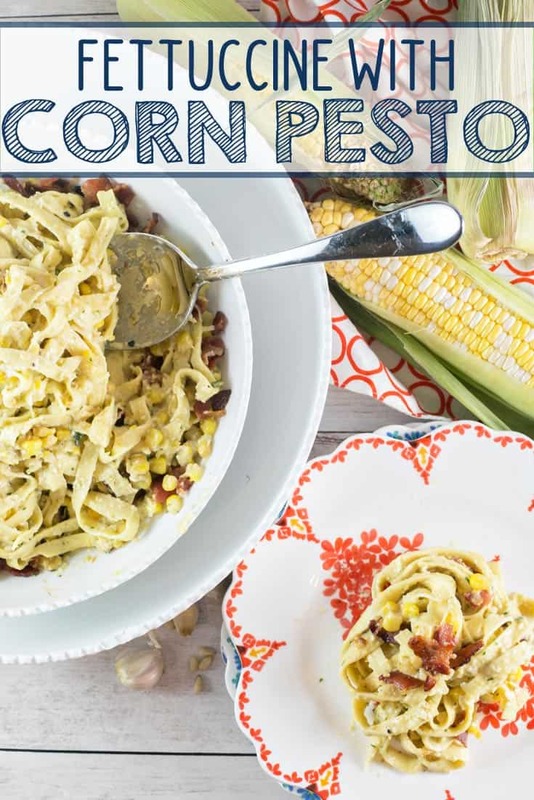 Once pasta is done cooking and back in the pot, add the corn pesto, reserved corn kernels, and 1/2 cup of the chopped herbs. Toss the pasta mixture over medium heat until warmed. Add the reserved pasta cooking water, 1/4 cup at a time, until the pesto is thin enough to coat the fettuccine. Transfer pasta to a shallow bowl and top with crumbled bacon, remaining Parmesan cheese, and remaining herbs. 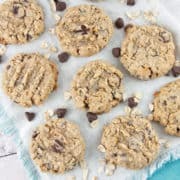 This recipe is right up my carb & cheese loving ally. With basil & bacon added… over the top!!! 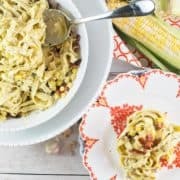 I LOVE the idea of using corn in pesto!! 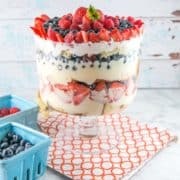 It looks so thick and creamy. 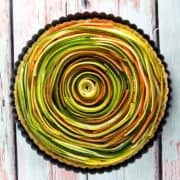 I’m obsessed with sweetcorn, must try this! You know…somedays you just need that comfort food! I love eating a dish like this when I’m having a not so fab day! Looks wonderful!! So true, Amanda. 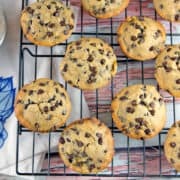 Comfort food somehow makes everything a little bit better! I’ve never thought of adding sweetcorn to pesto but it looks delicious, proper comfort food. I have just one word for this — YES! This looks and sounds amazing! 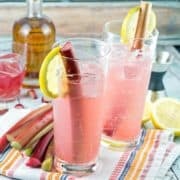 Perfect summer dish!